Unattainable goal or within easy reach? 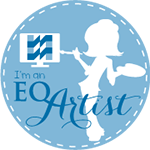 Quilters the world over continually strive to perfect the elusive scant 1/4″ seam allowance much like golfers strive for a hole in one or gourmet chefs painstakingly prepare the perfect souffle. The truth is, the perfect scant 1/4″ seam allowance is something every quilter can master with the right tools and practice. 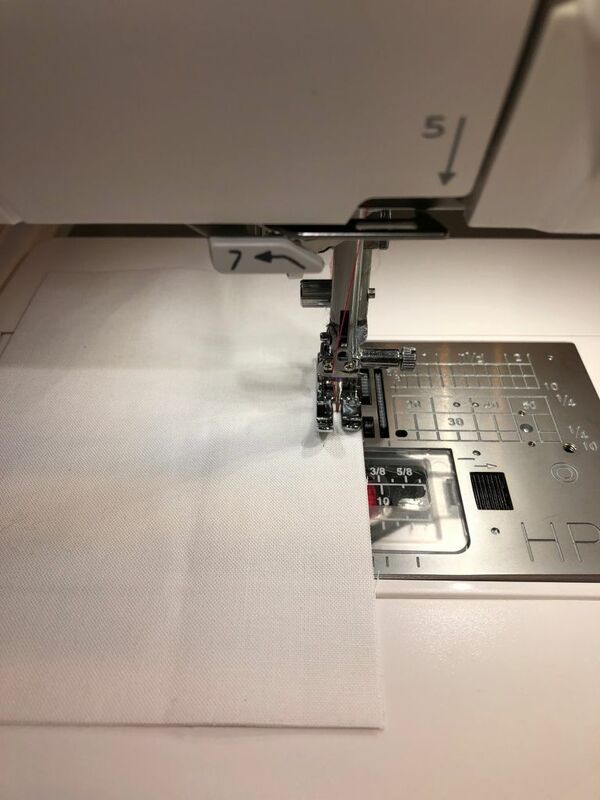 If you love precision piecing as much as I do, then stitching the perfect scant 1/4″ seam allowance is something you strive for every time you sit at the sewing machine to piece your fabrics into pretty blocks. And you want to be able to do it with ease. For years, I’ve heard quilters discuss and debate what actually constitutes the perfect scant 1/4″ seam. 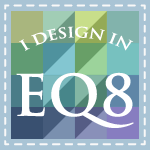 If you ask twenty different quilters you’ll likely get twenty different answers. And if you put those same twenty quilters in front of their sewing machines and ask them to stitch a scant 1/4″ seam, you’ll likely get twenty different variations measuring anywhere from a much-too-skinny 1/8″ to a chunky 1/4″ seam. So why all the fuss? 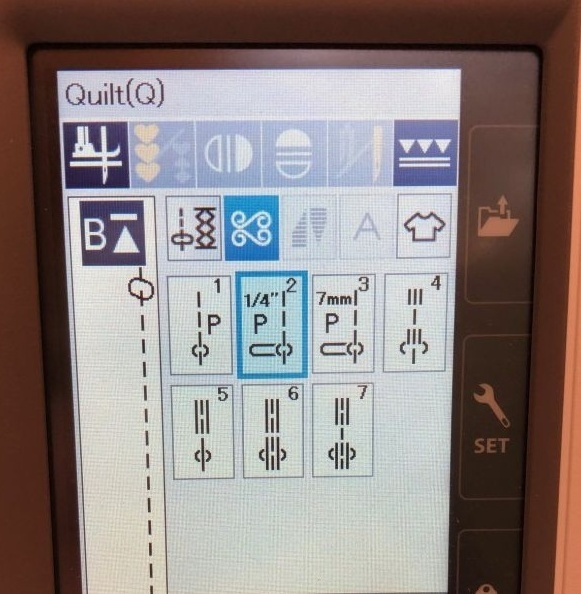 Why do quilters need to use a scant 1/4″ seam? When it comes to pieced units in quilting (unlike appliqué), it truly is all about the math and in particular, geometry. Units such as squares, rectangles, and triangles need to be cut accurately then sewn together accurately so they will measure accurately when the units are combined to create a larger block. 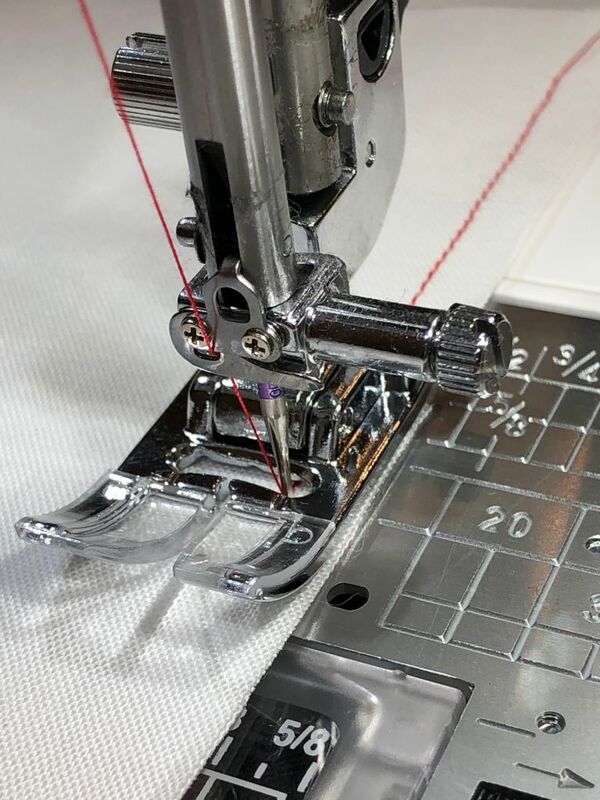 Unlike garment sewing where the industry standard is a 5/8″ seam allowance, piecing dictates a 1/4″ seam be used to sew fabric units together to create pieced blocks. Somewhere way back in history, quilters realized in order for seams to be pressed to one side they needed to allow for the bulk of the fabric itself to be folded over. A scant 1/4″ seam was far more effective and accurate to allow for this fabric bulk taking up space in the seams. Even the weight of the thread you use to piece your seams produces bulk and takes up space! For instance, have you ever pieced your blocks with 50wt thread and then switched to 30wt or 40wt thread and continued to piece your units? If not, try it. It will feel like you are stitching with rope instead of thread! 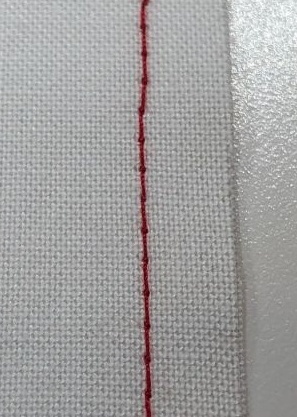 The weight of your thread makes a huge difference and that’s why I highly recommend 50wt cotton thread for piecing: the thread is strong enough to hold the fabric together without breaking but thin enough not to produce too much bulk or take up too much room in the pressed seam allowances. What exactly is a scant 1/4″ seam? This extreme close-up shows the cotton fibers. If you count the fibers from right to left, you’ll see two to three fibers from the red thread to the center of the black 1/4″ vertical line on the ruler. This scant quarter inch seam allowance leaves enough room to allow for the “fabric bulk” so when the seam allowance is pressed to one side, the units will still measure properly and the block isn’t too small. Now that you know what a scant 1/4″ seam should measure, how do you achieve it? The HP presser foot and throat plate. 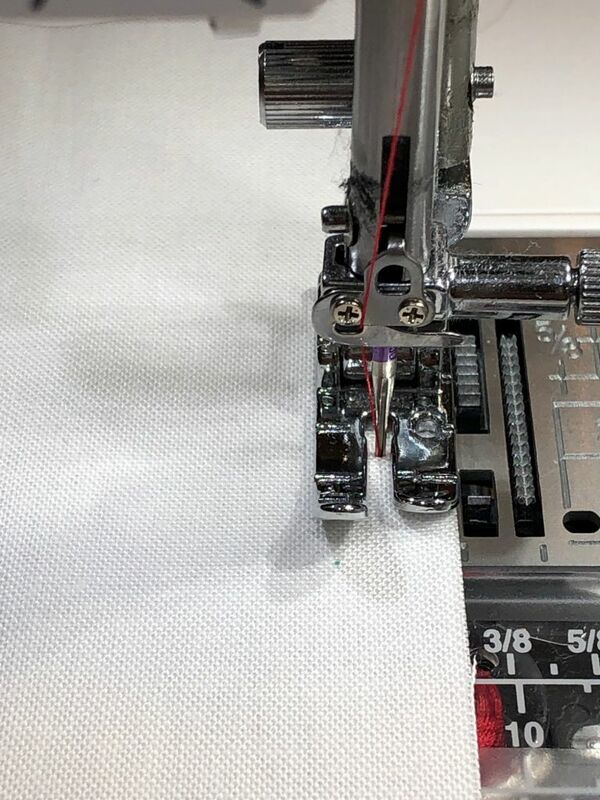 When you have the HP foot installed on your machine, it aligns the needle to the left position which is actually directly over the hook and loop mechanism so you’ll get the most perfect stitches available anywhere. The tension and balance of the stitches are second to none. Seriously, the quality of the stitching is that good. The throat plate itself has a single hole for straight stitching which won’t allow any fabric to be caught in the bobbin casing area. 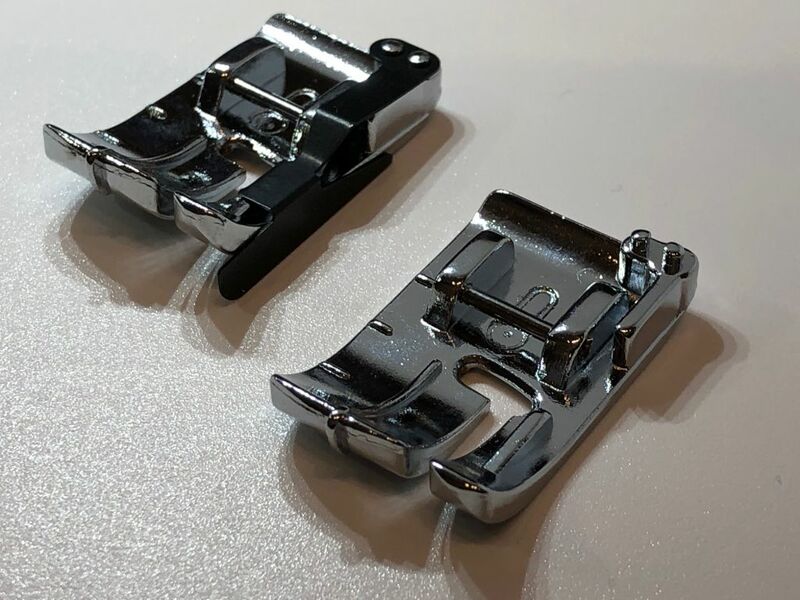 The HP foot is smaller than a typical 1/4″ piecing foot but within a few minutes you’ll feel absolutely comfortable and wonder why you ever hesitated to switch to the HP system. 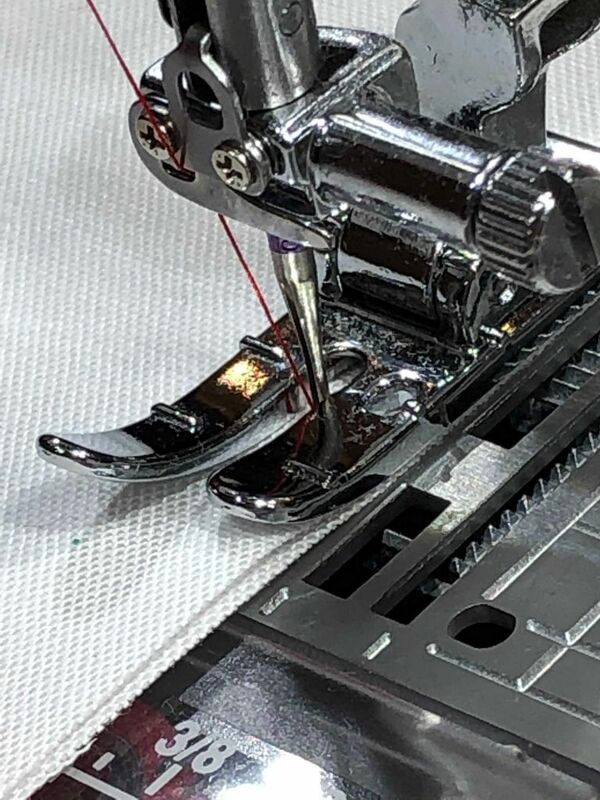 Sitting directly in front of the machine, look at how I have aligned the fabric with the right side of the HP presser foot. As I zoom in, I have not moved my hand or the camera. 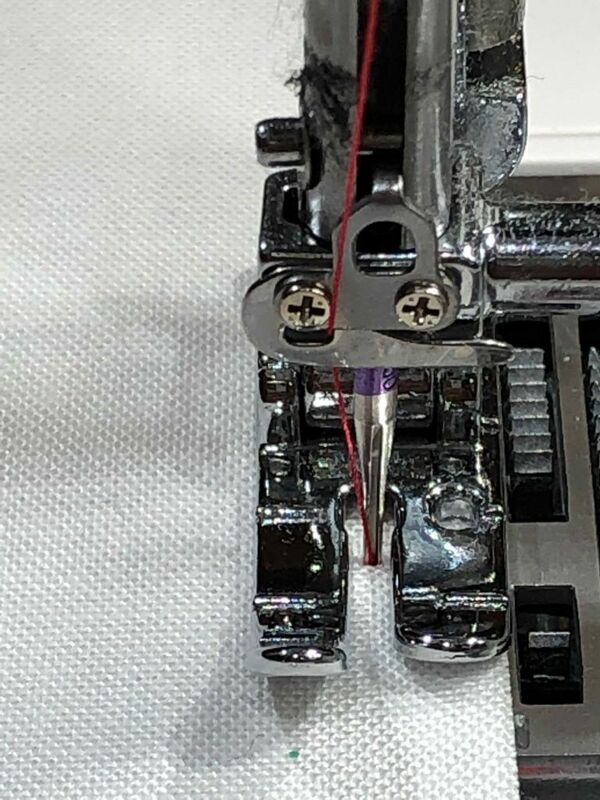 Finally, in this extreme close up, you can see the fabric is perfectly aligned with the right edge of the HP presser foot. It does NOT extend past the foot. It may take some experimentation and practice on your part. Or you may get it right on your first try! But really, it’s about finding your own personal “sweet spot” when you align the fabric to the edge of the foot as you stitch your scant 1/4″ seam. Simply allow the HP foot and the feed dogs do the work of pulling the fabric underneath the presser foot. Your hand will simply act as a guide to keep the fabric straight as you sew. And here’s another great tip: the HP system is absolutely brilliant when it comes to achieving perfectly curved piecing, too! 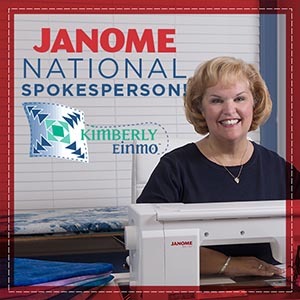 If you try the HP system and find that it just doesn’t feel comfortable to you, that’s perfectly okay because Janome has many other outstanding 1/4″ presser feet and there will be one or more that feels natural and will suit your individual needs! And that’s truly what quilting is all about: being comfortable and having fun while you stitch so you get the most perfect results. For starters, there is the ultra-popular and much-loved O foot and it comes with or without the guide on the right side of the foot! The O foot, comes with or without the metal flange, or guide, on the side for true piecing perfection. But there are even more options to help you get that perfect scant 1/4″! 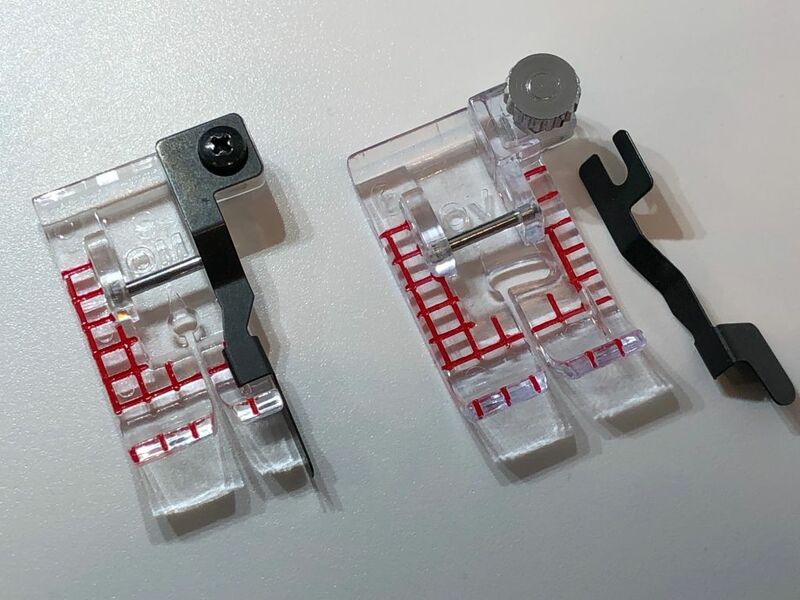 If you haven’t already done so, be sure to check out Janome’s clear quarter inch presser feet options. There is the OV foot and the OM foot with red markings to help you align seams and turn corners with ease when you’re piecing. There is the OV foot (right, shown with the optional metal guide which easily attaches as needed) and one of my most favorite presser feet, the OM foot, which keeps the needle in the center position when attached to the machine. And if you’d rather not use a quarter inch presser foot at all, there are still more choices. 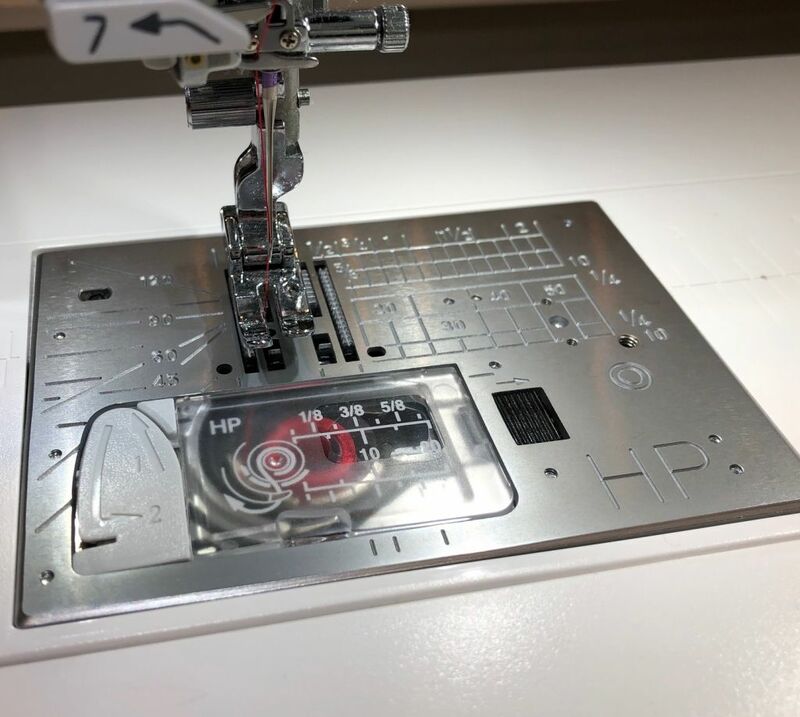 You can select the A presser foot which comes standard on the machine, and simply adjust the needle position and use the 1/4″ stitch from the menu of stitches as shown below! The A, or multi-purpose foot, and the 1/4″ stitch (from the stitch menu) combine to give you a perfect scant 1/4″ seam. There are so many options available to help you find your own personal scant quarter inch seam. Once you find the 1/4″ presser foot that suits you best, you can tweak the stitch settings even more by moving the position of the needle! 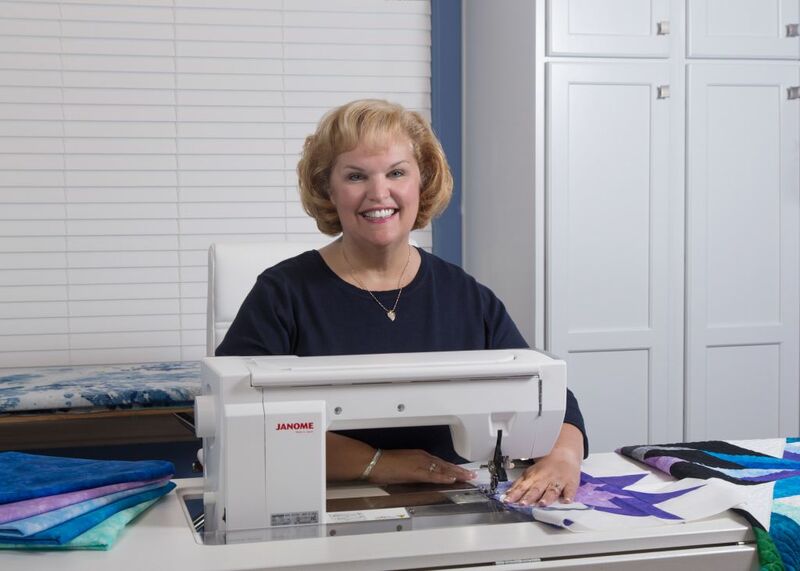 In fact, on the Memory Craft 15000, Creative 9400, and Professional 9450, there are 92 needle positions so you can adjust the needle until the seam is absolutely perfect and feels comfortable for YOU. Just think about that for a minute: there are 92 needle positions! 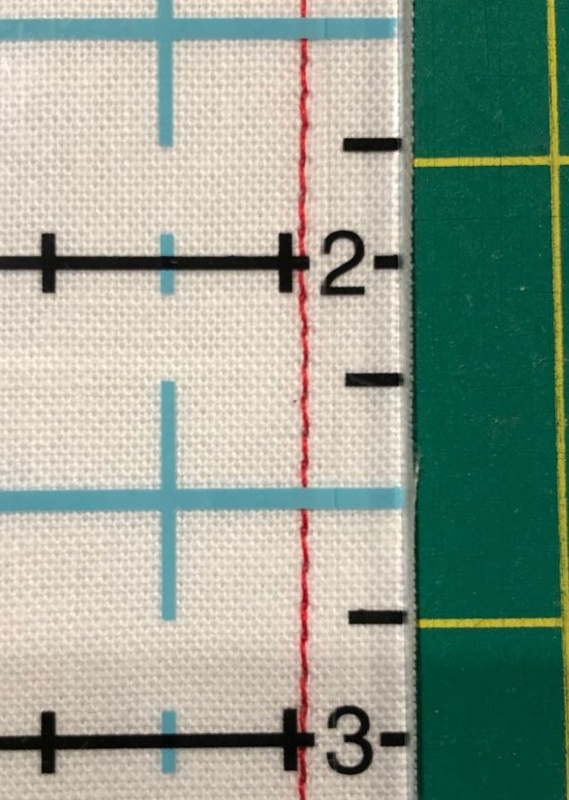 So now that you know what a perfect scant 1/4″ seam allowance should look like, I encourage you to take a few minutes and practice stitching a scant 1/4″ seam. Take the time to measure and make adjustments accordingly until your seam allowance is perfect. Once you find the “sweet spot” for you — you’ll see dramatic improvements in your piecing overall. Ultimately, you shouldn’t feel stress, pressure or angst. Quilting — piecing in particular, is supposed to be fun and relaxing. Don’t stress yourself out while you find your personal perfect scant 1/4″ seam. Just practice. Take your time. Experiment with the HP foot. Experiment with your own 1/4″ foot, no matter your machine make or model. Adjust the needle positions (if your machine has that option) until you find the position which works the best for you. 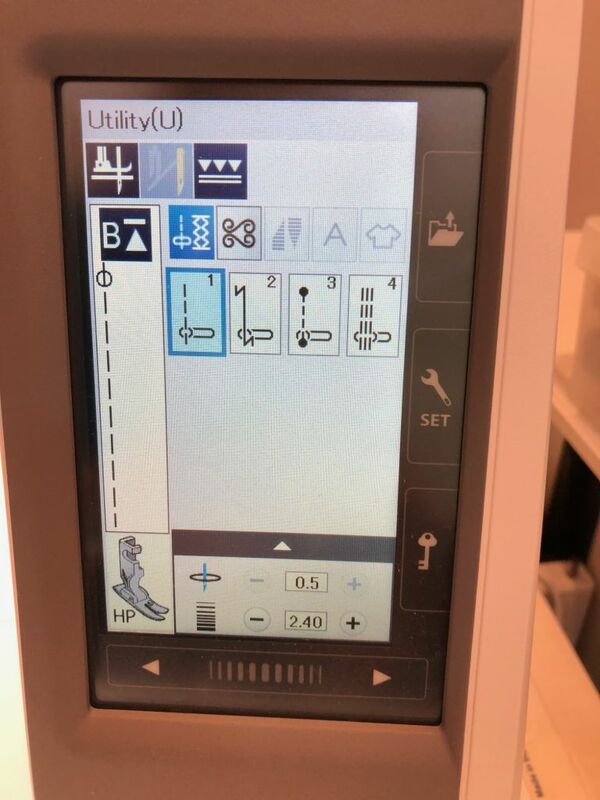 And if you’ve never tried the HP system, I personally invite you to visit your local Janome dealer. Just tell them I sent you. Ask to see the HP foot in action and try it yourself. I think you’ll just love it like I do. 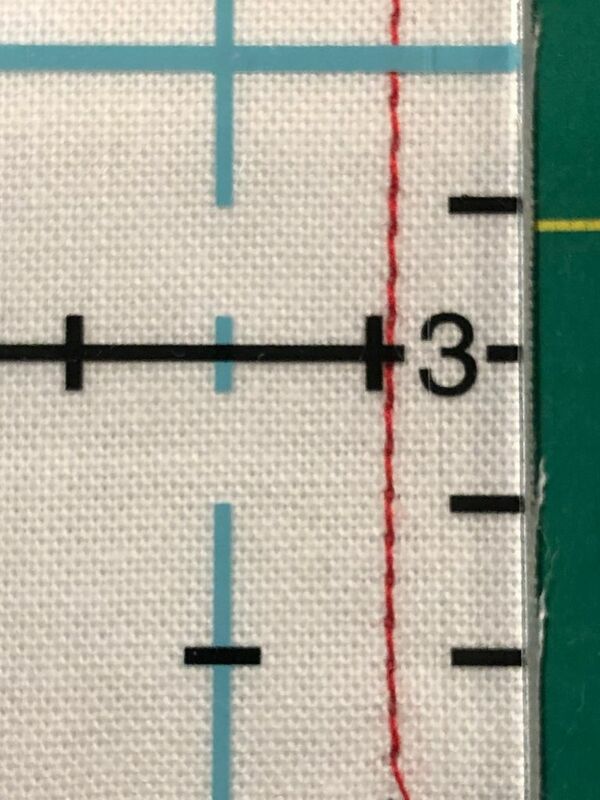 And remember, the perfect scant 1/4″ seam is truly within your grasp. Wonderful article. Thank you for all the information about achieving the perfect 1/4”. Well said! Kim, as always you are inspiring. I always start each project with the intent that this will be the *one*, perfect seams, no fudging…and at some point perfect 1/4” tends to waiver. Thanks for the article with hints to keep me on track. I am working on your Lone Star now and nothing will do but perfect scant 1/4. I will use these tips for sure. Thanks for the great article on the scant 1/4″. 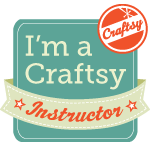 I have been using it for a number of years since taking a class with John Flynn and then being in three of your classes. Happy Thanksgiving to you and your family. Really helpful and informative. Thank you. Loved reading this article about reinforcing the scant 1/4” seam with the HP foot and the 50 wt thread. Very good information. Thank you. Thank you for the information on the 1/4 inch feet. I just got my 9450 and I’m still learning. I’m going to my dealer for my instructional session Thursday and I’m looking forward to it. I do love this machine! Fabulous news! How exciting for you!!! Thank you so much for writing this article. This is exactly the information I have been seeking regarding achieving the scant 1/4″ seam on my new 9400! You’re so welcome, Erin! So excited to hear you have a new 9400! I could be happier for you because I KNOW you’re going to love it! I got my 9400 about a month ago and I love it. I didn’t think I would ever replace my 6600 but I’m glad I did and now I know I can replace it. Your article on the quarter inch seam was wonderful. I’m looking forward to my first instructional session very soon. Thank you so much. I look forward to many more informative articles. Sew excited for you, Barb!! You’re going to LOVE that machine. And stay tuned — I’m always working on new things to share!